Contemporary nautical inspiration on board this alarm and GMT model by Breguet. 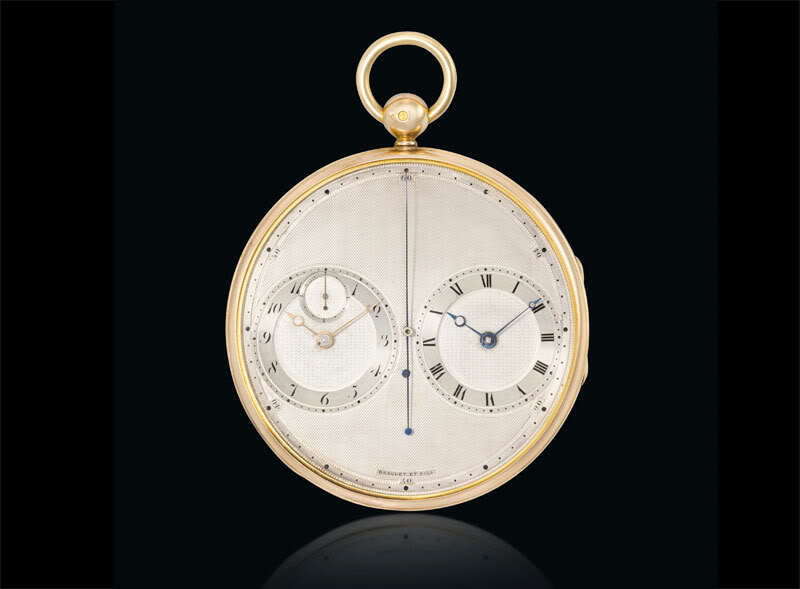 Breguet has always been known for making complex, classic watches. The brand’s tendency towards a traditional aesthetic, however, has sometimes deterred younger buyers. That trend seems to be changing. The latest example comes in the form of the new models introduced into the Marine collection at Baselworld this year. 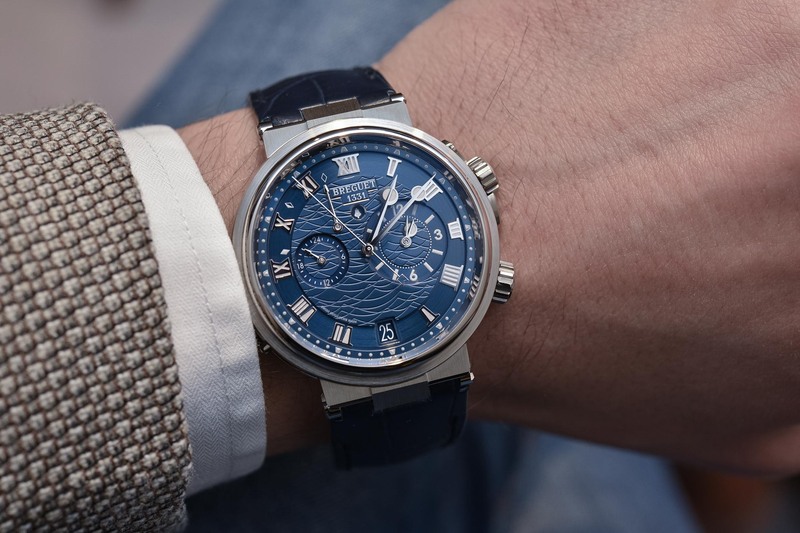 We’ve already covered the Breguet Marine 5517 in detail here. Now, we’re turning our attention to the Marine Alarme Musicale 5547, a contemporary-looking watch with some very traditional complications. 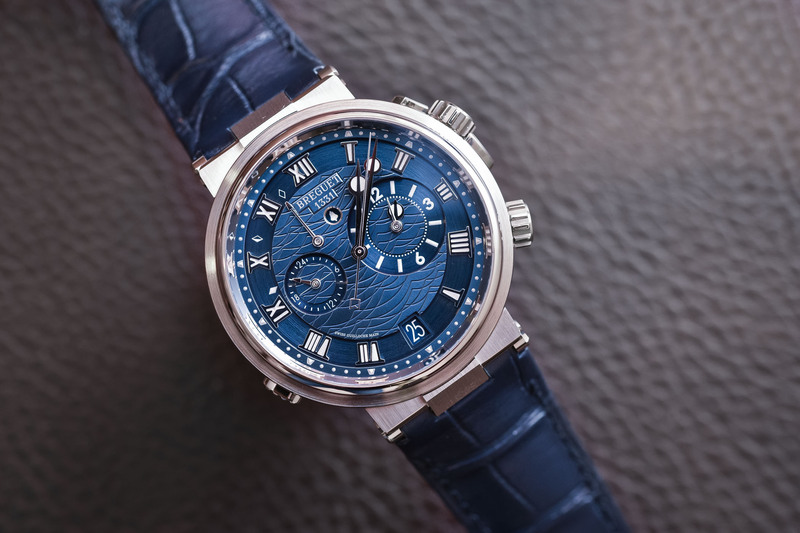 The 2017 Breguet Marine Equation Marchante 5887, which introduced the new design of the Marine collection, with distinctive case and newly styled dials. 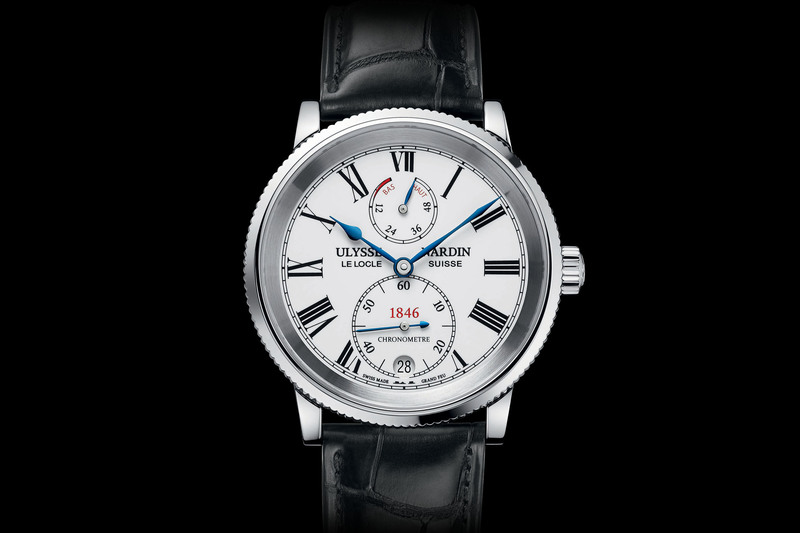 The new Marine models take their design inspiration from the Marine Équation Marchante 5887 (photo above). Introduced at Baselworld 2017, this uber-complicated watch, equipped with a perpetual calendar, an equation of time and a tourbillon, marked the revamp of the collection. Modern fonts, the bold use of colour and a contemporary-shaped case all work together to catapult this model into the 21st-century. 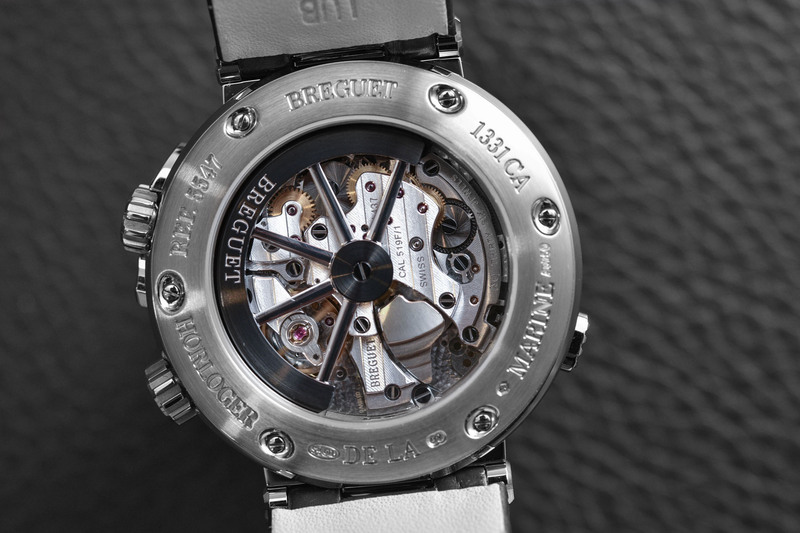 All whilst preserving the traditional techniques, such as engine-turned dials, that Breguet is known and loved for. The Marine Alarme Musicale 5547 builds on this aesthetic but in an even more contemporary fashion. The 40mm x 13.05mm satin-brushed round case with a fluted caseband is paired with squared lugs (also satin-brushed) and features a polished bezel, crown and protectors. There are three different metals available; white gold, rose gold and titanium. The gold dials of the two precious metal cases are blue and silver respectively and feature the wavy engine-turned pattern synonymous with the Marine collection. The titanium version, meanwhile, features a gold dial finished in slate grey and is arguably the most modern – and minimalist – looking. 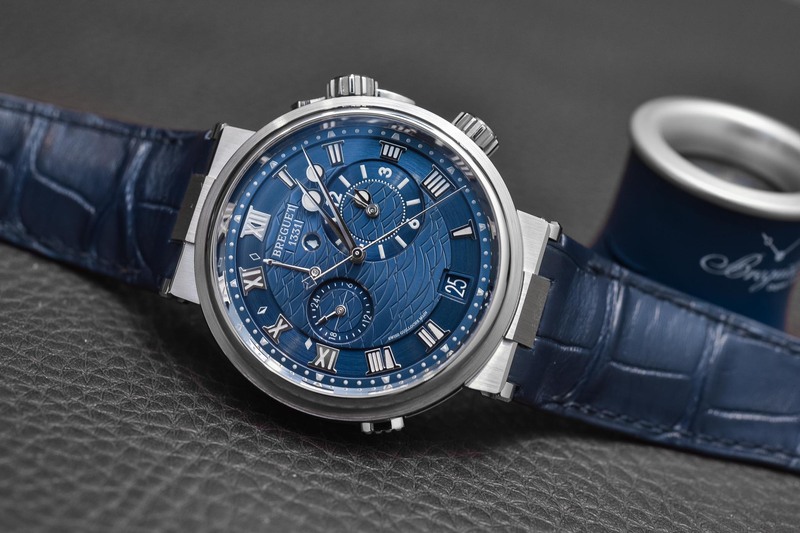 Like the Marine 5517, all three dials feature distinctive cut-out Roman numerals for the hour markers, somehow inspired by the shape of nautical flags. The style is very contemporary yet polarising. I think people will either love it or hate it. Regardless, it definitely lends a certain modernity to the design and creates a sense of unity throughout the collection. 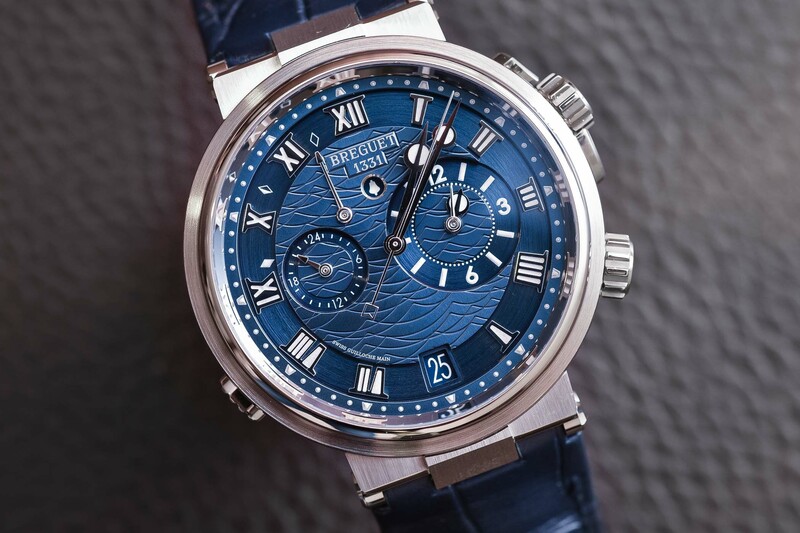 The hour markers, along with the nautical pennant-shaped 5-minute markers, the minute dots and the tips of the Breguet-style hands, have all been filled with luminescent material, ensuring legibility in all conditions. Again, a bold, perhaps even unexpected style choice for Breguet but one which reflects the younger aesthetic the brand is striving for. The layout of the dial itself is relatively simple and belies the complexity of the movement beneath, which incorporates three complications. 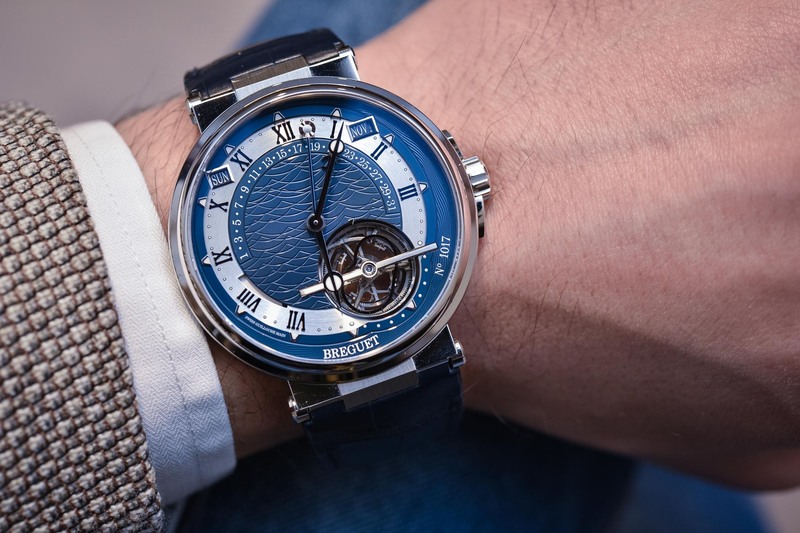 Time is displayed centrally by Breguet-style hands, complete with central seconds hand counterweighted by a maritime flag representing the letter ‘B’. The date is shown via an aperture at 6 o’clock. Two sub-dials occupy the centre section of the dial. The smaller one at 9 o’clock displays a second time zone, while the larger one at 3 o’clock is used to set the time for the mechanical alarm. An unusual complication, and one not often found in today’s modern watches, the alarm can be set up to 12 hours in advance to remind you to do an important task, leave for a meeting or simply wake you up in the morning. At the appointed time, the striking mechanism is triggered, and the hammer repeatedly strikes a gong in quick succession for up to 15 seconds when fully wound. As an added visual touch, a ship’s bell simultaneously appears through an opening at 12 o’clock, in keeping with the maritime theme. The alarm is wound and set by the crown at 4 o’clock and can be turned on and off by the pusher at 8 o’clock. 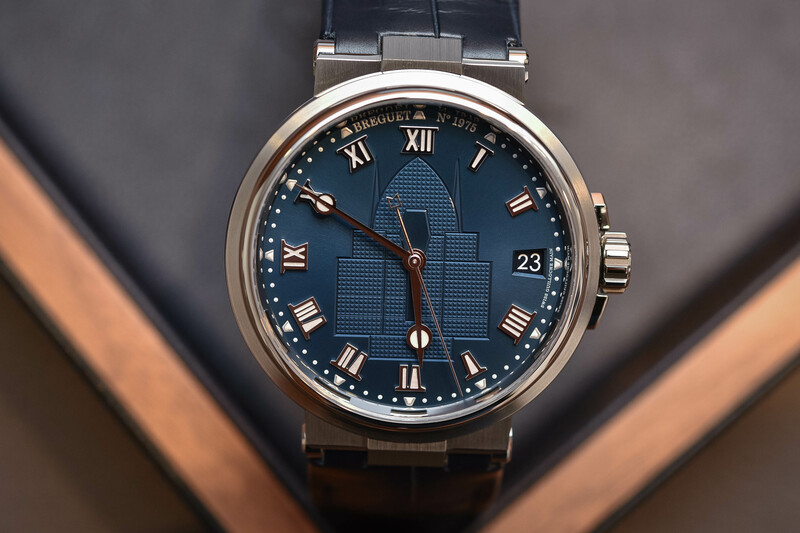 The alarm is driven by the mainspring and if you look closely, you’ll notice that Breguet has incorporated a subtle power reserve indicator for the striking mechanism between 9 and 12 o’clock. When the model is fully wound, the arrow points to the ‘full’ diamond-shaped indication at 9 o’clock (here, it is completely unwound). There are also ‘half-full’ and ‘empty’ indications at 10 and 11 o’clock respectively. On the gold versions, these are in the same white as the hour markers, etc. On the titanium version, however, they are in red, introducing a touch of colour to the otherwise monochromatic dial. 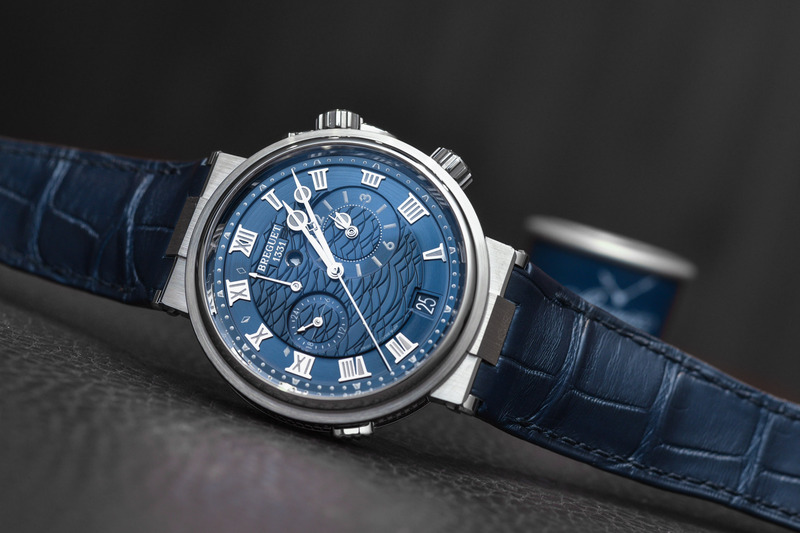 On the reverse side, a sapphire caseback reveals the self-winding, 4Hz Calibre 519F. 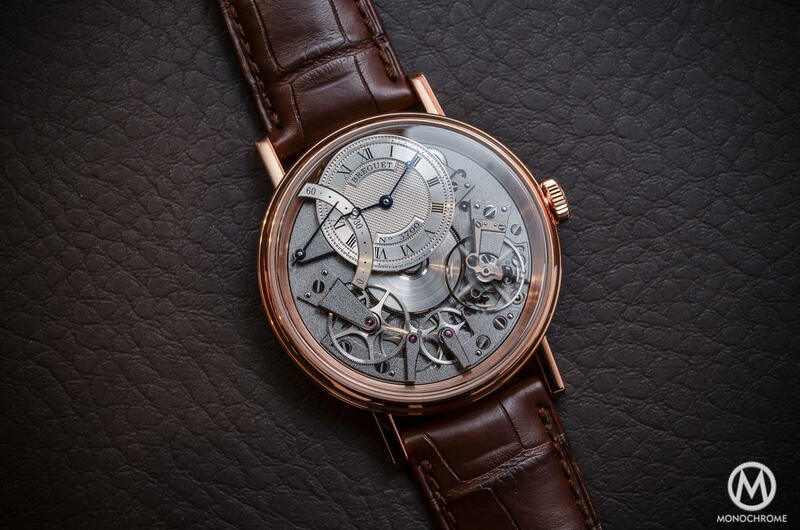 This movement was developed in conjunction with Swatch Group stablemate Blancpain and was first used in the Breguet Le Réveil du Tsar 5707 back in 2003. That model, however, featured an off-centred seconds hand while thankfully the Marine Alarme Musicale keeps things simple with centre seconds. Offering a power reserve of 45 hours, it boasts an inverted in-line lever escapement with silicon horns and a silicon balance spring. On the wrist, the Marine Alarme Musicale 5547 wears comfortably. The narrow bezel makes it look a little larger than it is, but that also helps keep a relatively busy dial uncluttered. The modern design touches make it surprisingly versatile, creating a functional watch that can be dressed up or down. It may not be suited to black tie occasions but can be worn for just about everything in between and offers 50m of water-resistance for good measure. In total there are six variants to choose from (three different dial colours paired with either an alligator leather or rubber strap). Pricing starts from EUR 27,900 in titanium and goes up to EUR 39,800 for the gold versions. 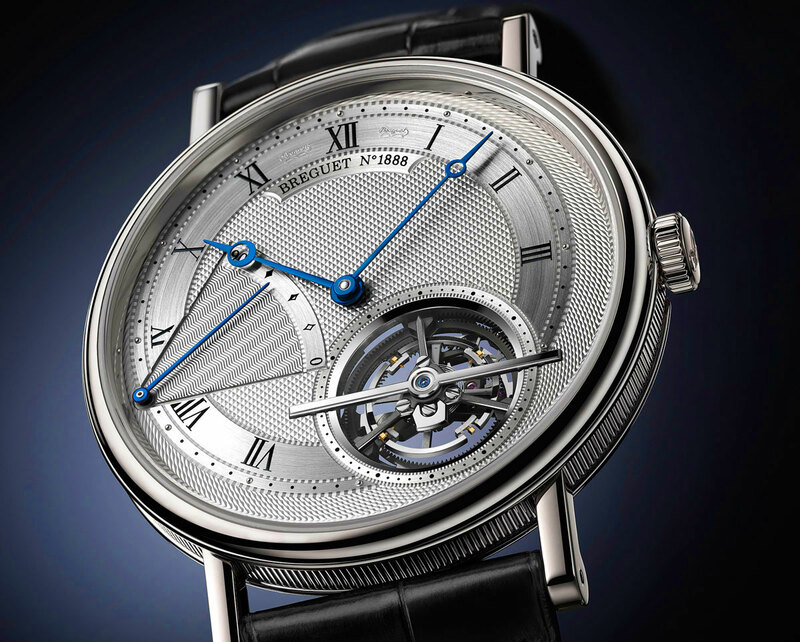 For more details, please visit breguet.com. Case: 40mm x 13.05mm - 18k white gold or 18k rose gold or grade 5 titanium case - brushed and polished - fluted caseband - sapphire crystal on both sides - water-resistant to 50m. A bit of a curate’s egg, IMHO.